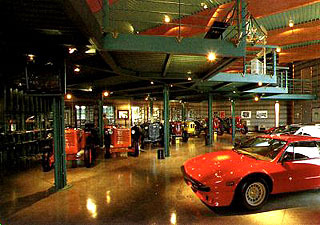 The Lamborghini factory also have a company museum on the grounds. This houses many special cars including the last made of several models and several Formula 1 cars. The closest airport is Bologna airport, (not Bologna Forli). To get to the factory, other than by car, you can take a bus leaving from Bologna main bus station. It will take about 45 minutes to get to Sant'Agata. The bus stop is just 5 minutes walk from the factory. Or, you can take a train to San Giovanni in Persiceto (which is located 6 km from Sant'Agata Bolognese. From there, you should take a taxi, although being a small station, usually there are no taxis waiting in front of it. See our Factory page for an area map. After Ferruccio Lamborghini's, his son Tonino Lamborghini built and opened the Centro Studi e Ricerche Ferruccio Lamborghini as a tribute to his father. 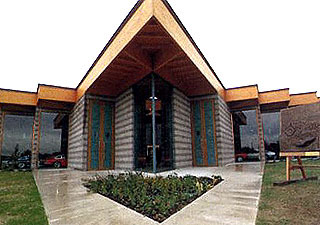 The museum was inaugurated on May 13, 1995. This museum is only 25 kms from Automobili Lamborghini and is located in front of the Lamborghini Calor factory where burners and boilers have been manufactured since 1960. The museum holds just about everything Ferruccio achieved during his life with most of the cars on display being from Ferruccio's own private museum. These include an early 400GT, and an Islero, a P250 and P300 Urraco, as well as a Miura SV and an Espada which were Ferruccio's own cars, and several tractors starting with the first one built in 1947. The Jarama S driven by Ferruccio and a stunning white Countach QuattroValvole are also present. 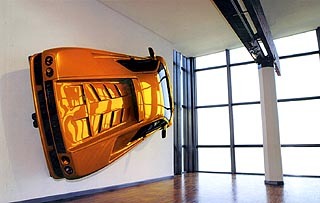 In the center of the museum you will even find a Lamborghini Helicopter hanging from the ceiling, one of two prototypes built by Lamborghini, which never reached production. Other displays include a Lamborghini F1 engine and several other complete engines. The surrounding walls display hundreds of pictures showing Ferruccio throughout his life. All over the museum you can find books, brochures, scale models and assorted memorabilia surrounding the life and career of Ferruccio Lamborghini. The person to contact regarding tours is is Marina Franchi. Her email is info@lamborghini-fashion.it, phone number is 011-39-0518-62628 or fax 011-39-0518-64956 from the U.S. The museum does not keep regular hours and is only open on appointment. If you let them know in advance and you come during operating hours of the factory, they will open the doors for you and let you into the museum. It is well worth the trip! 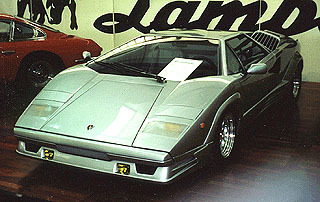 A great attempt was also made by one longtime Lamborghini enthusiast, to start a Lamborghini museum in North America. 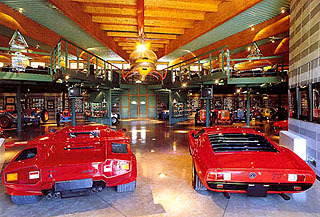 The Lamborghini Museum in Norman, Oklahoma was started by Ron Miller, an unparalleled Lamborghini enthusiast who owned one of every production model. He hoped to eventually acquire several one-off prototypes and every brochure the company printed. Those who had seen the nearly completed museum say Miller spared no expense, with a custom made lighting and sound system. Ron Miller's passion for the raging bull will be sorely missed following his tragic death. The nearly complete museum never officially openned to the public and was permanently closed. Vehicles from the collection have been sold off as a result of not being able to find an interested backer to continue the project.